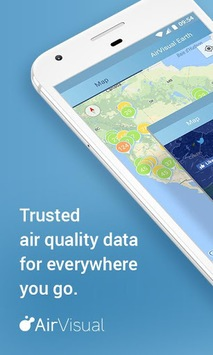 No advertising - just all of the air quality information you want, in one place. 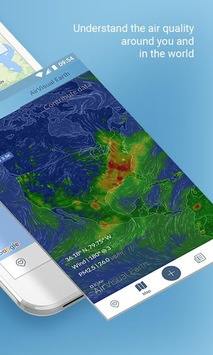 Welcome to the first and only app to provide real-time and forecast air pollution and weather data for more than 10,000 cities around the world. + Historical, Real-time, and Forecast Air Pollution Data that matters: detailed figures on key pollutants for more than 10,000+ cities in 80+ countries. + 7-day Air Pollution and Weather Forecasts: information to help you plan your outdoor activities. + Health Recommendations: follow our advice to lower your health risk and achieve minimum exposure to pollutants. Relevant information for sensitive groups with asthma or other respiratory (pulmonary) diseases. + Weather Information: your one stop for temperature, humidity, current conditions and forecast weather information. 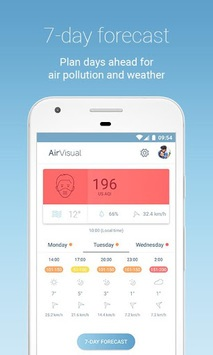 + Live Monitoring of 6 Key Pollutants: track real time concentrations of PM2.5, PM10, ozone, nitrogen dioxide, sulphur dioxide, and carbon monoxide. + “Sensitive Group” Air Quality Information: relevant information and forecasts for sensitive groups, including those with respiratory (pulmonary) illnesses, such as asthma. + Historical Data Graphs: view short-term air pollution trends for the past 24 hours. + Ad-Free: enjoy the full app nuisance-free. + Trusted Air Quality Stations: access US Embassy & US Consulate readings for China. + Growing Coverage: monitor China (with US Embassy and consulate ratings), India, Malaysia, Singapore, Japan, Korea, USA, Canada, the UK, Australia, Mexico, Brazil, France, Hong Kong, Thailand, Indonesia, Chile, Turkey, Poland, the Netherlands, Mongolia, Andorra, Czech-Republic + more - and cities such as Beijing, Shanghai, Guangzhou, New Delhi, Tokyo, Mexico City, Bangkok, London, Los Angeles, New York, and 9,000 others - in one place!